It took ESPN almost four hours to cover this report in any fashion. Most of the sports world Wednesday was buzzing about Brett McMurphy’s Facebook story, which used text messages, screencaps and interviews to show that Courtney Smith told Ohio State head football coach Urban Meyer’s wife Shelley of domestic abuse from Smith’s then-husband Zach (then an Ohio State assistant coach) and that Shelley Meyer said she was going to tell Urban about the abuse. Courtney Smith also spoke about the situation in a Stadium video (McMurphy was reported to be heading to Stadium a while back.) And outlets from Sports Illustrated to CBS to NBC to Yahoo all covered the story quickly and prominently on their sports landing pages. But for almost four hours after McMurphy’s report (posted to Twitter at 10:20 a.m. Eastern, and to Facebook slightly before that), ESPN hadn’t addressed the report on TV, on the ticker, or online, something they finally changed with an unbylined ESPN.com story posted at 2:06 p.m. Eastern (shortly after Stadium aired a full interview with Courtney Smith) and later revised at 2:21 p.m. Eastern. (They did later provide radio coverage as well, with fill-in Paul Finebaum Show host Matt Jones interviewing McMurphy at 3 p.m. Eastern.) 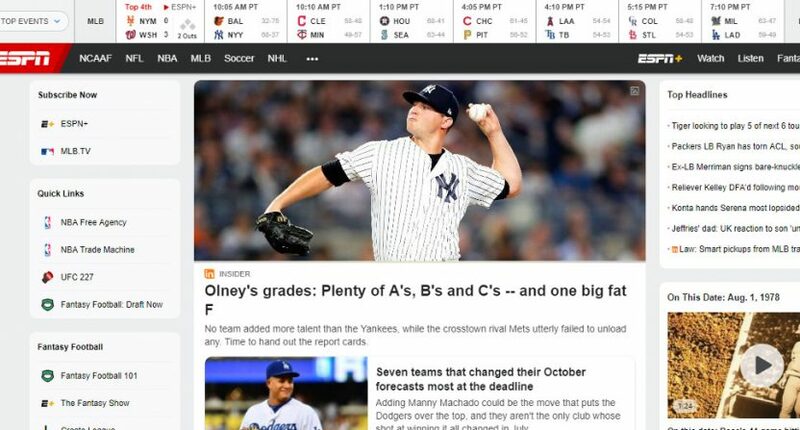 But there weren’t exactly a lot of other compelling stories in sports demanding a higher priority, as you can see from the above screenshot of ESPN.com at 1 p.m. Eastern, and many are wondering why it took the network so long to get to this. Zach Smith was fired last week after McMurphy broke the news that Smith had been arrested in 2009 (while on Meyer’s staff at Florida) for battery of his pregnant wife, that police had investigated him in 2015 for domestic violence and felonious assault, and that Courtney Smith (now divorced from him) had received a domestic violence civil protection order against him this month. But Urban Meyer said at Big Ten Media Days last week that in the 2009 situation, “what was reported wasn’t actually what happened,” and that he wasn’t informed of the 2015 incidents, saying “there was nothing” and “I don’t know who creates a story like that.” So McMurphy’s new reporting is quite a big deal here, and it makes a case that Meyer did know of the 2015 incidents, despite him publicly saying otherwise last week. If two highly-promoted talk shows — two central foci of a company's investments and resources — can't set aside planned topics for the Urban/Ohio State story on AUGUST 1, what is the flipping point, @ESPN? Damn, High Noon be talkin' 'bout PING PONG right now. The longer ESPN delays reporting this, even if it's to confirm Brett's reporting (note the irony there), we'll have to ask: Does ESPN/ESPN.com normally sit on stories this long for corroboration b4 at least noting them? I think not. Something is really weird when the Columbus Dispatch nor ESPN have any hint of the Urban Meyer/Zach Smith story on their sites more than 2hr after the story broke. And it has to be more than pettiness & protecting Meyer. On the CFB page of ESPN — the “world wide leader in sports”, there are currently more clickable links about Harbaughs chicken comments than anything related to the Zach Smith/Urban Meyer stuff. ESPN is a joke. In the end, ESPN did run a digital story on this, and they put it in their top headlines. And they credited McMurphy appropriately in that piece, something they haven’t always done. But they still haven’t addressed it on air, even on shows like Outside The Lines that would seemingly be a natural fit. And they also haven’t yet added it to the ticker. The delay in covering this isn’t a great look for the company, and it raises questions about why they delayed so long. Update: Awful Announcing has heard most ESPN CFB reporters were at a company seminar when this broke, which added to the delays in covering it. However, you could argue other reporting options could or should have been employed given the situation, and given that much of their eventual piece was only restating what was in McMurphy’s report.